You say you want a 44mm-wide Royal Oak but you don’t want a Royal Oak Offshore? Well, one option is to just opt for this Audemars Piguet Royal Oak Tourbillon Chronograph Openworked. Sure, you need to invest in both the platinum case and skeletonized and decorated chronograph tourbillon movement – but isn’t it worth it? SIHH 2016 sees a few platinum-cased Royal Oak watches, as well as a healthy assortment in gold. In fact, there is but one steel-cased standard Royal Oak for 2016 – and it isn’t budget-priced either. Probably the most accessibly-priced (relatively speaking) Royal Oak watches for 2016 are the new Royal Oak Offshore Diver Chronograph, but I digress. Let’s now talk about this very lovely new reference 26347PT.OO.D315CR.01 Audemars Piguet Royal Oak Tourbillon Chronograph Openworked watch. It is entirely possible that Audemars Piguet previously released a non-Offshore version of the Royal Oak in a 44mm-wide case, but I can’t seem to think of it. With that said, previous versions of the Royal Oak Tourbillon Chronograph may have actually had this larger case size because, in my recollection, they looked larger – but I wasn’t measuring at the time. What is probably new, however, is producing the Royal Oak Tourbillon Chronograph with a beautiful skeletonized (openworked) dial and movement. There is absolutely no shortage of new openworked watches from Audemars Piguet this year, but this particular model is a bit different for maintaining so much of the traditional dial so as to preserve as much legibility as possible. That means the subsidiary dials are totally intact as well as the hour markers and minute scale. Underneath, you see Audemars Piguet skilled decoration at its best in the calibre 2936 movement which is artistically cut up for your viewing pleasure. The beauty of openworking is how many approaches there are to the concept. 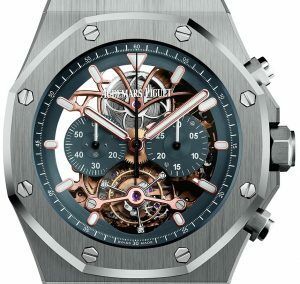 Look at a range of different skeletonized Audemars Piguet watches, and you’ll see how the designers there continue to experiment and play with different aesthetic approaches to the idea of artistically cutting away at “unnecessary” parts of the movement metal. This approach focuses mostly on thin, gracefully curved lines and an overall emphasis on shape. There is no hand-engraving, but rather brushed surfaces and, of course, polished beveled edges. I happen to really like this look, even though I equally appreciate other skeletonization techniques as well. The calibre 2936 hand-wound movement is made up of 299 parts and operates at 3Hz (21,600 bph) with a power reserve of 72 hours. The movement is a rather thick 7.6mm, which is probably why Audemars Piguet designed this Royal Oak case to be 44mm, rather than, say, 41mm wide. It is possible that this is because the case needed to be thicker and the proportions of the Royal Oak would have been off if it looked too thick compared to its width. Unfortunately, no automatic winding or power reserve indicator in the movement, but it does offer the time with subsidiary seconds dial and 30-minute chronograph. The 44mm-wide 950 platinum case of the Audemars Piguet Royal Oak Tourbillon Chronograph replica Openworked is matched with a blue and pink-gold-accented dial and matching blue alligator strap. 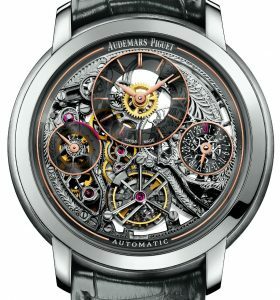 It is a bit of a theme for Audemars Piguet to mix steel or platinum and pink gold for watches this year in 2016 – a design decision I take no issue with. I am not sure, but it also looks like in addition to the pink gold hands and hour markers, the skeletonized movement bridges might be in 18k pink gold as well.